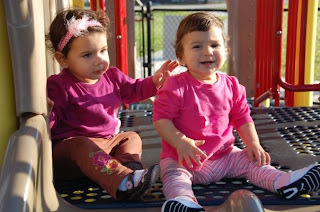 Today's post is going to be about Olivia and her Friends and I will show some pictures of Olivia with her friends, which is always fun..
First off, Olivia's first friend is her cousin Erika, who was born 5 months before she was. This is a picture of them last Christmas... they were wearing matching dresses.. too cute! This is Olivia and her WTE friends, Grayson and Caden, they were all born within the same week.... Us mommies met through "What To Expect" when we were pregnant and we have been fortunate enough to meet in person several times.. It's always great to get the kids together... this was the first time they/we met! ....and this last one is another one of Isabella and Olivia... the day they met... Isabella was 5 months and Olivia was 4 months... Isabella is the niece of my friend Marianna, whom I've known since we were 3 years old! I know they will forever be best friends.. it's so adorable!!! Qué popular Olivia! Y la madre! jeje. Siempre me da risa imaginar cuando Isabella u Olivia pregunten cómo es q ellas se conocían desde pequeñas y les digan: "bueno, es q Adriana y Marianna..." Vamos a sonar tan antañonas, pero ojalá ellas puedan conservar una amistad tan linda y duradera como la nuestra. Los quiero muchísimo y espero verlos pronto. Qué planes tienes para tu cumple, por cierto?